Master Sgt. 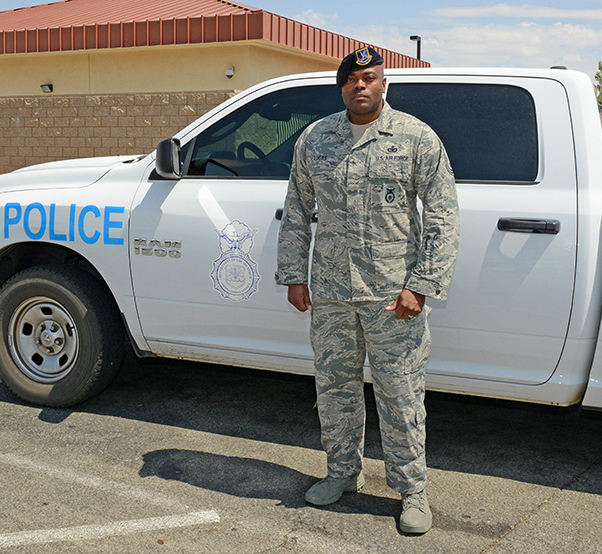 Maurice Lucas II, 412th Security Forces Squadron, was recognized for peacefully subduing a suicidal man in a housing area on Edwards AFB last year. That commendable streak ended Oct. 8, 2016. 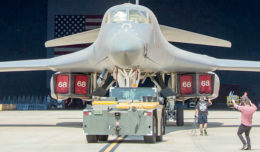 Lucas had to respond from the Air Force Research Laboratory facilities far from main base and radioed ahead to his fellow 412th SFS defenders to secure the area. “I high tailed it back to main base from the North Gate. When I arrived on scene it was sort of a cluster,” Lucas said. He got specific information from the subject’s wife, who was the one who made the call to Security Forces. She told Lucas her husband had been drinking, was really irritated, that he had a pistol and a rifle and was going to try to commit suicide. After getting the exact address from the spouse, Lucas positioned his troops and then parked his vehicle two houses away from the subject’s house behind an “old rusty truck” that was on the street. After exiting his vehicle, he saw the subject poking his head in and out of the garage looking at him. In a neighboring yard a parent and two children were playing. Lucas said the man kept approaching him, yelling and cursing and got within Lucas’ “reactionary gap,” which is a tactical term for a distance at which a law enforcement officer still has time to react before a suspect or subject is upon the officer. “He said, ‘Kill me. Kill me right now,’” Lucas said. Upon searching him, the man didn’t have a firearm on him but had two boxes of .40 caliber ammunition in his pockets. Lucas went to check the garage where he saw the man was poking his head out. Lucas then noticed the car’s trunk was open, as he took a look inside he discovered an M4 assault rifle with an M68 red dot sight that was turned on. There was a round in the chamber with the selector switch moved to the fire position with a 40-round magazine attached and about six additional 30-round magazines loaded. “He also had a shotgun with a round in the chamber, fully loaded with a grocery bag full of shotgun shells ready to go,” said Lucas. 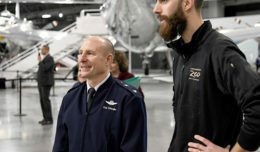 For his actions that evening, Lucas was awarded his fourth Air Force Commendation Medal Aug. 2, 2017.